Mark is a former Conservation Director of the RSPB; he is now a writer, blogger, campaigner and author. How did you first become interested in wildlife, and birds in particular? Like many people – I’ve been in love with nature since I was a child. I can’t remember any particular moment when the switch was turned on but I’ve never lost an enthusiasm for the natural world and an interest in how it works. This is where I should plug my book Fighting for Birds where the first chapter tells that story. The short version is: birdwatcher, A-level biology, Natural Sciences at Cambridge, working for Prof Lord Krebs in the Zoology Department at Oxford, a PhD on pipistrelle bats at Aberdeen University, a post-doctoral fellowship back at Oxford working on Bee-eaters and then into the RSPB as a scientist first, then Head of Research and then Conservation Director. It looks pretty sensible looking back on it but it wasn’t planned and I’ve always just done the next thing that looked like the most fun. Two important moments were accidentally meeting the right person at the right time in a pub and pointing out a mistake in someone’s work (who then offered me a job) so it’s a bit difficult for a young biologist/conservationist to model their career path on mine. You were Conservation Director of the RSPB for over 12 years, what were your biggest challenges in that role? Well, it’s a great job and I got an awful lot of satisfaction out of it – and also a good salary. But it is a big job and I think that I wasn’t sure whether I could do it for the first couple of years. Balancing the internal aspects and the external aspects is a challenge. As a manager within a large charity I had budgets of tens of millions of pounds to construct, defend and manage and a lot of staff too. I had to feed policy papers to the RSPB Council and influence the RSPB from within. Spending millions of pounds over the years on buying land for nature reserves was great fun (and I had an excellent team who did all the hard work) but it has the same types of challenges as buying a house except scaled up in terms of money, complexity and we were dealing with lots of potential deals at any one time with a large, but still limited, budget. But the external world, influencing government policy on issues such as protected areas, climate change, genetically modified crops, marine protection etc etc and feeding the media with stories were other large calls on one’s time. And the external world doesn’t organise itself conveniently with respect to your internal world commitments so there was a lot of work, and a lot of juggling to do. And I had a personal life too with a couple of kids growing up and moving through their schooling at this time. Lots of juggling. What project or accomplishment do you consider to be the most significant in your career to date? I’d rather look at the package as a whole. Just about everything that went really well (or really badly) was a team achievement. As a leader, one tends to be in the spotlight more than some of the people who did more of the work and it’s important to remember that – which isn’t too difficult if one was once much further down the chain of management, as I was! But I take a collective pride in the role of the RSPB in getting the veterinary drug diclofenac banned in India (it killed tens of millions of vultures – long story), reducing bycatch of albatrosses on fishing boats, getting the Climate Change and Marine Acts, influencing agriculture policy and a host of practical conservation projects which made a difference. But actually it was as a leader and manager that I think I did a really good (though far from perfect) personal job. I recruited good people and generally speaking arranged things so that people were in the roles that suited them best where they could deliver most for nature conservation. That all happens below the surface – and maybe my staff would tell you that I’m kidding myself anyway. What do you think ecologists and wildlife professionals should be doing more of to further their cause in protecting and conserving the natural world? We need more information on which to make evidence-based decisions. But decisions aren’t just made on evidence and as a scientist who ended up working as an advocate it didn’t take me too long to realise that. And that’s a fact of human life (think of your own) not just of politicians and civil servants. We all tend to use science and facts like a drunk uses a lamppost – at least as much for support as for illumination. If a decision is going to be made today, great science tomorrow is too late. Scientists have to realise that they are rarely in charge of the timetable of decision-making and adjust accordingly (I guess that’s the balance between the internal and external world again). There are two main ways to adjust: plan your work so that you are ready with the answers when they are needed (that’s often very difficult to do in practice) and be prepared to give your expert opinion without as much evidence as you would like, honestly and clearly when asked (saying ‘I haven’t a clue yet’ is rarely the right answer). You’ve authored several books, written numerous articles for newspapers and magazines, and of course run your highly successful blog – how did your interest in writing come about? I’m very opinionated! I like talking too! But I also like listening. I listen to different opinions and evaluate their strength in my head. And I like being stimulated by listening to good communicators. When I listen to the Today programme on Radio 4 I listen as much to how the questions are asked, and how the interviewee responds as to what they are actually saying. And I’ve just come back from something called the Bird Fair (Glastonbury for birders – without the drugs and music but a lot more binoculars) where I heard great talks by the likes of Chris Packham, authors Helen Pilcher and Hugh Warwick and an American ornithologist called John Fitzpatrick. All gave outstanding talks which gripped me with their content but I was also learning from the technique too. I’d like to influence what people think – that’s why I write. Do you ever run out of things to write about and where do you turn to for inspiration if you need it? I am very opinionated! Since leaving RSPB about 2300 days ago I have written c4400 blog posts. Maybe 20 times I have struggled to think of a single thing to write but then I read something, or heard something or asked my wife and I was off again. The natural world and how to save it is quite a big subject! You’ve been campaigning against grouse shooting for a number of years now, can you summarise why you would like to see it banned and when you first become aware of the issues? 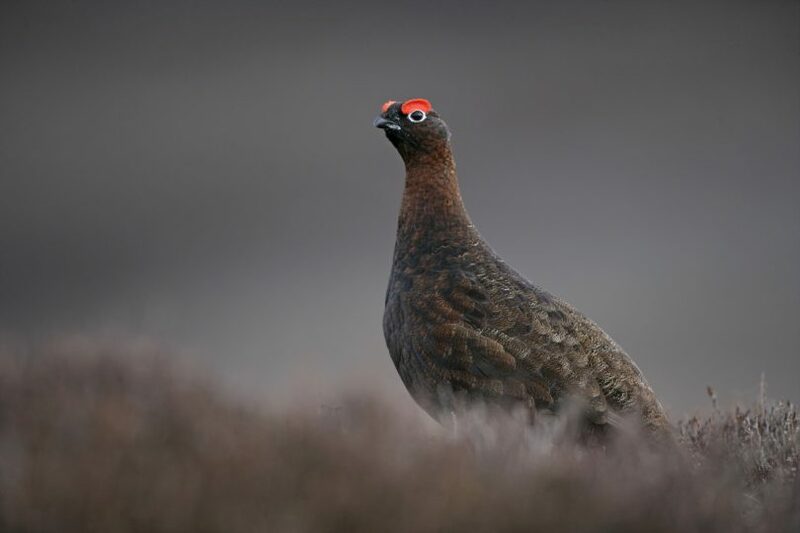 About half a million red grouse are shot for fun each year and that so-called sport depends on very intensive management of our uplands in places like the Peak District and Yorkshire Dales (burning, drainage, killing foxes and crows etc) as well as on high levels of wildlife crime (eg killing protected birds of prey – eagles, falcons, kites and harriers). That management increases flood risk, increases water pollution, increases greenhouse gas emissions and robs us all of our wildlife – all for a hobby of shooting birds for fun. If we hadn’t been doing this for 150 years we’d never start now. 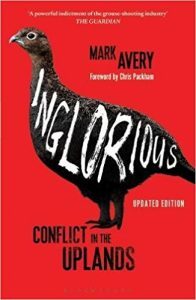 The longer version, with references and the arguments spelled out, is in my book Inglorious – Conflict in the Uplands. Do you see grouse shooting being banned any time soon? In my lifetime yes. This may happen via licensing of shooting estates first, and Scotland is in the lead with that, but I would be surprised if licensing works and so banning of a damaging hobby will be where we end up. Low key, walked-up grouse shooting may survive (and that’s fine by me) but the very intensive driven grouse shooting is doomed. So what’s currently in the pipeline? What projects/campaigns/books are you working on at the moment? I’m writing three books at the moment and I’m not sure in which order they will emerge so I won’t say more. My blog is a good place to keep in touch. Further information: Dr Mark Avery is a scientist by training and a naturalist by inclination. He writes about and comments on environmental issues. Mark worked for the RSPB for 25 years until standing down in April 2011 to go freelance. He was the RSPB’s Conservation Director for nearly 13 years. 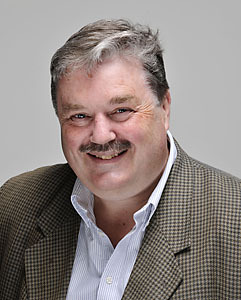 Mark lives in rural Northamptonshire and is a member of Cheltenham Racecourse, the RSPB, the Wildlife Trusts, the BTO, the National Trust and the Labour Party. Mark’s blog can be found HERE. Further information about Mark’s books can be found HERE. 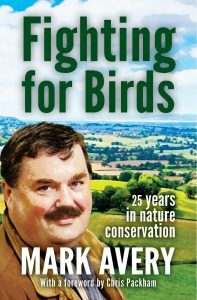 You can follow Mark on Twitter @MarkAvery.